MYRTLE BEACH, S.C. (April 11, 2019) - The Myrtle Beach Pelicans turned in a dominant pitching performance against the Fayetteville Woodpeckers, but timely hitting for the Woodpeckers helped them to a 3-2 win at TicketReturn.com Field at Pelicans Ballpark on Thursday night. 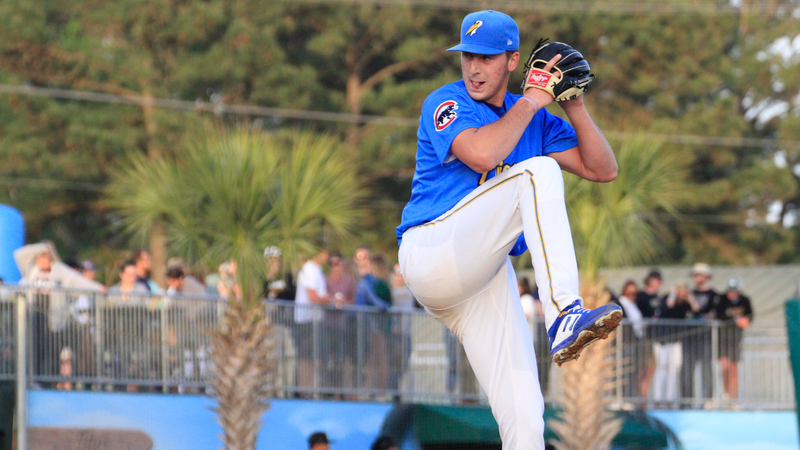 For the first time in 2019, the Pelicans (1-7) out-hit their opponent, but a run in the top of the ninth inning for Fayetteville was the difference in Myrtle Beach's fifth-consecutive loss. With the game knotte at 2-2 in the top of the ninth inning. Fayetteville's (5-3) Colton Shaver doubled home Seth Beer to give the Woodpeckers a 3-2 lead. In the bottom of the ninth, Chad Donato (1-1) locked down the win for the Woodpeckers by getting out of a two-on, two-out jam. Earlier, in the first inning, the Woodpeckers jumped on the board first. After Seth Beer drew a two-out walk, Jake Adams blasted a two-run homer to make it 2-0. After the homer by Adams, Bryan Hudson, the Pelicans' starting pitcher, settled in to retire the next nine batters he faced. Hudson fired five innings of four-hit baseball and allowed just two runs while striking out five and walking a pair. The Pelicans finally got their bats going in the bottom of the seventh inning. Carlos Sepulveda reached first with a leadoff single and two batters later, Aramis Ademan brought him home on a two-run shot to right field to tie the game at two. It was Ademan's first home run of the season. Game two of the series will take place on Friday night at 7:05 p.m. Paul Richan (0-0, 0.00) will get the ball for the Pelicans, while JP France (0-1, 9.00) will toe the rubber for the Fayetteville Woodpeckers. Friday will be a Fish Fry Friday with fish fry dinner plates and $2 craft drafts available from 6-8 p.m. It will also be a First Responders Friday, where any first responders can show their ID at the Anderson Brothers bank box office to recieve half off their ticket, courtesy of 707 Shooting Range, Allegiant Air, WMBF and Mix 97.7. Also on Friday, bring your dog to the ballpark as the Pelicans host their second Bark-in-the-Park of 2019. Dogs are admitted free with the purchase of a Budweiser Thirst Inning Deck ticket.